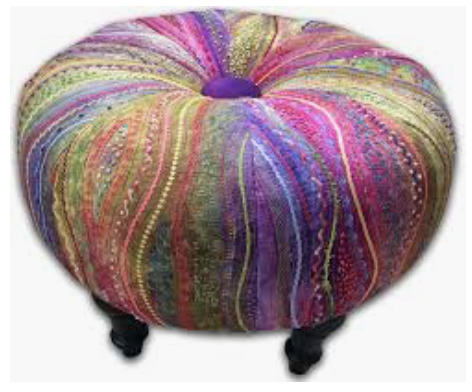 Each participant will make one 18” diameter Tuffet. The 1st session teaches the technique to make the foundation pieced Tuffet cover and sewing as much as possible. You will finish the cover at home before the second session. In the 2nd session, we will put it all together and you will end up with a completed Tuffet. You will get your kit in the first session and bring it to the second session. FINISHING KITS for the class are available . The finishing kit consists of bun feet, wood disk, decor button for the top. The cost is approximately $130. SUPPLIES: (1st session) PRECUT STRIPS and decide arrangement prior to class. to trim to 2"! Additional fabric for button and bottom....See session 2. You can use as few or as many DIFFERENT fabrics as you like. 2) 1 1/4 yards muslin for the foundation piecing. class. Later at home you will need a zigzag stitch. 5) Neutral color thread that coordinates well with most of your fabric. 8) #2 pencil, also colored pencil if you have one. 10) Rotary cutter with a sharp blade and cutting mat 18"X 24" works best. 12) Iron and personal ironing surface. (Optional) quilt shop has iron and board to use. enables you to see a drawn sewing line. 1) Your tuffet finishing kit. the button. This Is the center of all strips. You will want this to match. anything since it will be on the underside of the tuffet. 4) Rotary cutter and BOTH large and small sharp fabric scissors with a point. 5) Small ruler and sharpie to mark the foam if you choose to bevel the top. In the workshop, we will bring additional supplies and tools for you to use. 2 class sessions. Teacher fee and pattern included. Finishing kit is separate. Requirements: All regular sewing/quilting materials are needed. Don't buy finishing kits at Joann's or other discount stores. Those will not work with the Tuffet Source's patterns. We provide reasonable and competitive prices for our tuffet kits. Tuffets are expensive to make, but well worth the cost.